In this article we look at a wonderful species of true crab, the boxer or pom-pom crab (Lybia tesselata). This is a remarkable species for many reasons not least that it is one of the most commonly imported crustaceans in the aquarium hobby. If we do not include species that are imported for their “cleaning” activities then it is probably the most widely available species of true crab in the marine aquarium hobby. This is undoubtedly a very pretty species with a mosaic of colours adorning its carapace this is only part of the story. Our fascination with the boxer crab, and the reason behind its common name, is the remarkable mutualistic symbiosis it has with anemones. Many aquarists will be familiar with the large hermit crabs that have a shell that is home to one or two largish anemones. The latter benefit from morsels of food liberated by the poor table manners of the scavenging hermit crab whereas the crustacean is afforded some protection from the stinging tentacles of the anemone. In this situation the anemone has reasonably stable anchoring point. The same cannot be said for a small crab like Lybia though. For one thing a true crab must shed its skin to grow and if the carapace is home to an anemone then the crab will be extremely vulnerable while the anemone changes position, and for that matter, how will the anemone know that the crab has shed its exoskeleton. So crabs and anemones do not mix? Well, if you are a species of anemone crab adapted to an existence on or around anemones you could use their bulk and stinging power as a refuge but then you cannot stray too far from your host. The boxer crab has come up with an excellent way of retaining the stinging power of the anemone without the constraints of remaining within an anemones close proximity; it holds the anemones in its pincers. .. many specimens imported are less than 1cm across the carapace and therefore the anemones are much smaller still. Each one may be only a few millimetres in diameter with very small tentacles. Not much use against a marauding predator? Well, it depends upon what kind of predator you are talking about. Unlike the large hermits crabs that give a lift to anemones on their shells the boxer crab can squeeze into small crevices and is very unlikely to venture into the open for long. Thus potential predators are likely to also be small rock dwellers such as gobies and other small fish. The pincers of the boxer crab are so small and well adapted to their role in holding the anemones that they are ineffectual in defence but with the extra punch afforded by the stings of the anemones they act as a reasonable deterrent. Interestingly boxer crabs are known to use at least three species of anemone in this way including Triactis producta and Bundeopsis sp, both of which are alleged to have very powerful stings for their size. These anemones can be found in a free-living state and are therefore not dependent on the crab, whereas the reverse is certainly not true. The boxer crab advertises the fact that it is in possession of such useful weaponry by waving its pincers in the general direction of any potential predator in the manner of a shadowboxing pugilist, hence one of the common names for this species. However, despite the fact that the anemones will be used if needed the crab could much rather avoid any potential conflict and a quick bluffing combination of two to the imaginary body and one to the head is deemed sufficient and the crab makes a hasty retreat. Having a really specialised pair of pincers can be great, the fact that there are a number of different species of Lybia that carry anemones is a testament to the fact that they must be very useful and the compromise that the crab has made by reducing the size of its pincers into no more than a couple of grippers must have some drawbacks? Crab pincers, correctly termed chelipeds, are useful in defence, as anyone that has received a nip will testify. The boxer crab would appear to have defence covered. But what about food acquisition? A strong and powerful pair of pincers is very useful at gripping but also tearing or ripping. Many scavenging xanthid crabs closely related to Lybia use their pincers to pull apart food into manageable chunks. Lybia’s pincers are not strong enough to do this and should they try it would mean putting down their anemones and rendering themselves extremely vulnerable to predation. As a result the boxer crab has adapted to use its second pair of legs, the first pair of walking legs in this role and they are very effective at ripping off small pieces of food from larger chunks and manipulating them delicately towards the mouth. Observations have also shown that the anemones themselves can have a role in food capture for the crab. In this instance the crab uses the cnidarians as “mops” in which they are wiped along the substrate. 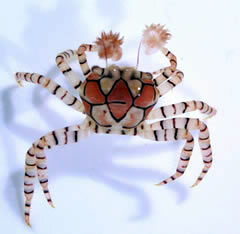 The particulate material collected in the sticky tentacles is then removed by the mouthparts of the crab. Either feeding method will lead to the nourishment of both the crab and its anemones. In an aquarium situation a variety of foodstuffs will be accepted including chopped mussel, cockle, prawn and shrimp. However, boxer crabs are elusive creatures and any aquarist prepared to stock this fascinating animal must be prepared for very sporadic sightings unless it is the only individuals housed in a small aquarium. Many aquarists report sightings as infrequent as once a year or less! This is likely to be the case in a large reef aquarium with plenty of busy fish but hopefully more often in smaller systems. Of course, it all depends upon where the crab takes up residence and its subsequent growth and development. When choosing an individual make sure that it has hold of one anemone in each pincer. Although it can seemingly replace one if it becomes damaged or lost (the exact mechanism for this is unclear but may involve the crab taking a cutting from a healthy individual) the first moments after introduction will be when this crab is at its most vulnerable and it may need both its stingers to repel any over-inquisitive species. Needless to say this is not a crab for an aquarium containing any fish species likely to bother crustaceans and is best suited to coral rich aquaria with peaceful fish in residence. 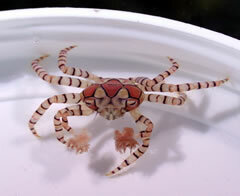 Occasionally you will see boxer crabs for sale with a bright red-orange mass on their underside. This is an egg mass carried by the female crab (Boxer crabs have separate sexes –distinguished by the width of their tails. Males have very thin tails whereas those of females are much larger as they assist in holding the egg mass in position) and although no one has succeeded in successfully raising the planktonic young of this species through the various life cycle stages this may be a suitable candidate for the enthusiastic hobbyists with plenty of spare time an the ability to apply themselves to a problem! As we end our look at this aquarium wonder we hope that we have tempted some of our readers to have a go at keeping this wonderful animal in their aquarium. If not then consider this: there are many sights in nature that we will never be lucky enough to witness but the sight of a boxer crab moulting is one that is within the grasp of every marine aquarist. Watch in awe as the crab carefully places each anemone in turn in a safe place and then as quickly as possible liberates itself of its old exoskeleton. Then it quickly grasps its anemones in its almost vestigial pincers before retreating to a safer place to allow the new body to harden. Wonders like this are a privilege to behold and something that can happen in your own living room. Ying Zhang for original article idea. Checklist of Sea Anemones (Cnidaria: Anthozoa) From Egypt. Report of stingings by the sea anemone Triactis producta Klunzinger from Red Sea. Levy S, Masry D, Halstead BW.